A simple eternity ring formed from precious 18ct white gold and set with a quarter carat of glittering diamonds. 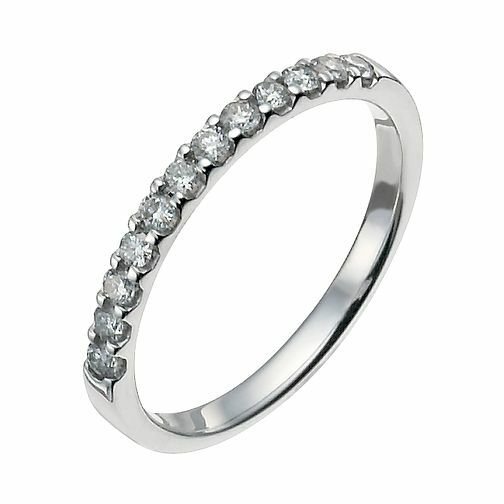 18ct white gold 0.25ct eternity ring is rated 5.0 out of 5 by 5. Rated 5 out of 5 by Anonymous from Perfectly elegant and subtle Looks beautiful on its own but also goes perfectly with my engagement ring. Lovely and sparkly, just the right size and comfortable. Can’t wait to wear it soon! Rated 5 out of 5 by Anonymous from Gorgeously compliments my engagement ring This wedding band is exactly what I wanted and I bought it when they had their 25% OFF deal off. Great price for a great product. I'm in love and can't wait to wear it!